Here’s a quick chart to start! If you want to skip to the actual comparison, click here to jump to the Table of Contents. If you want a compelling reason to just buy the Mojo right away, click here! If you just want to read the article, that’s cool too and I would love it if you did, so: Read on! Hugo 2, reporting for duty. The Hugo 2 does provide a bit better micro detail, cleanliness, and air, but it’s a very small difference and it took quite a bit of A/B testing for me to come to that conclusion. Most people won’t hear that big of a difference in passing, and that’s the honest truth. 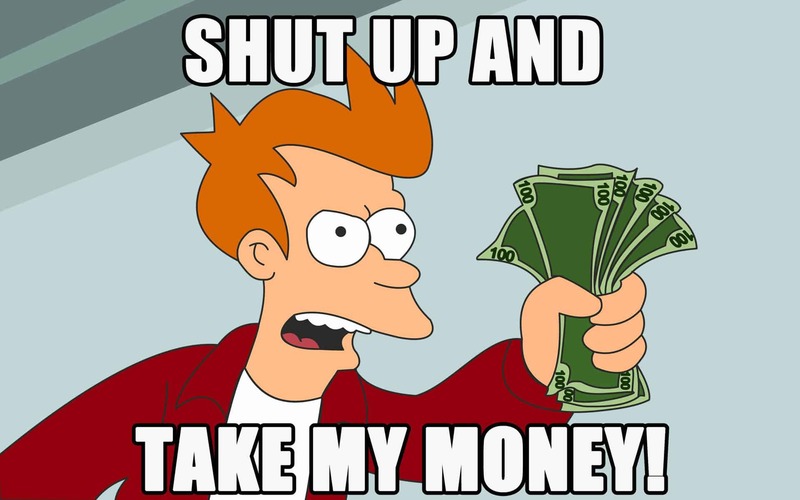 It is my opinion that you should save your money and just purchase the Mojo without hesitation. It provides 98-99% of what the Hugo 2 is capable of at a fraction of the price. The Law of Diminishing Returns is something that I write a lot about in my articles, and it’s even more evident in the case of Amps and DACs. Yes, there are subtle differences between various amps, but by and large, it’s much easier to discern the differences in headphones than anything else in this hobby. I’m of the mindset that the difference between Amp A that costs over $1000 and Amp B which costs much less is like organic peanut butter vs. regular. Yeah, the ingredients are a bit better, but it tastes almost the same, and it’s still peanut butter at the end of the day. If we were to get really technical about it, yeah, organic peanut butter definitely has a different texture and it’s not as thick as peanut butter with added junk in it. Still, is it worth all that extra money? Depends on who you ask. It’s a bit more of a pleasant conversion as far as the DAC is concerned. The Hugo 2 seems like it’s trying really hard to impress you at times, and while it doesn’t fall flat, it’s overall less of an enjoyable listen due to it’s sometimes extreme sense of sterility. Related: What is a USB DAC? Still, the Hugo 2 is incredible. But so is the Mojo. It has a bit more of a warmer, laid back vibe to it (while still retaining all of those great details) which I think will resonate with more people including myself. So why spend more money than necessary? This is what I would be saying if I were you. 🙂 He even has the right amount to drop on the Mojo with change leftover! All of those are rough estimates and do fluctuate a bit. Are those amps better? Perhaps, but it’s not enough of a difference for me to throw that much more money at people. It also pretty much blows everything else I’ve heard out of the water as far as lower priced stuff. Check out what I’ve demoed here on my Reviews Page! 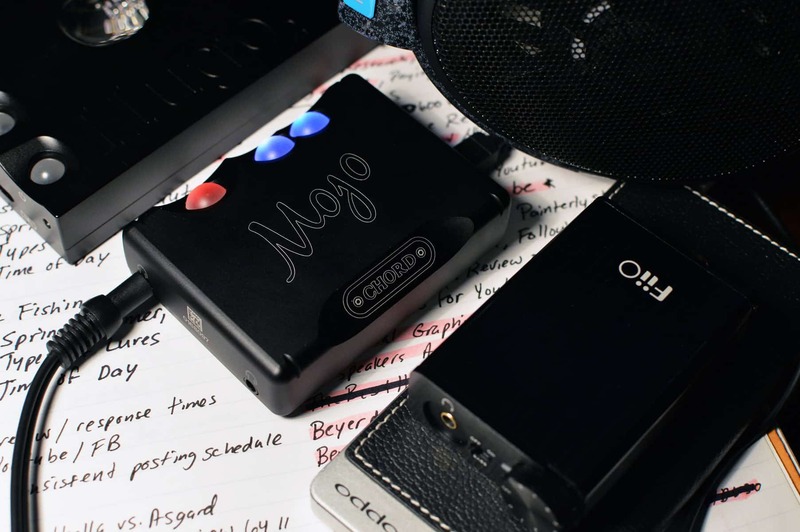 The Mojo will instantly improve the sound quality of any track you throw at it. A lot of Amp/DACs can make that claim, but the sound that the Mojo pumps out is indeed better across the board. Soundstage, detail retrieval, dynamics, clarity, atmosphere, texture, resolution, instrument timbre, vocal intimacy, you name it – it’s all more natural and realistic to a startling degree. I had my doubts about whether a roughly $500 piece was that much better than something in the entry level category or even a step above that, but the Mojo quelled my doubts from the get go. 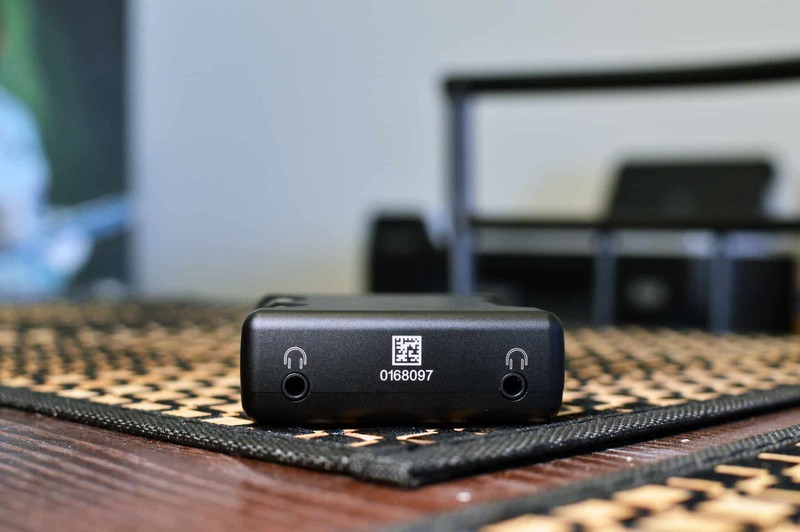 The Mojo is very versatile, and works with anything that can output coax, optical, or micro USB. You can use it as a Gaming rig for your console or PC, and it performs magically – revealing every minute detail you could possibly ever imagine. It does this with music as well, with eyebrow raising precision and accuracy. There’s simply nothing else you could possibly ever need above this price point, unless you’re an audiophile or just simply willing to experiment. For everyone else, the Mojo is certainly an end game piece of equipment. In addition to that, you can plug two headphones into the Mojo for comparisons sake, or simply to share music and movies with a special friend. 🙂 I can’t think of another DAC that provides this feature off the top of my head. Price to performance ratio is beyond astounding. Like I mentioned before, I tested the Hugo2 vs. Mojo with a pair of HD600’s as well as some other headphones. Though the Hugo 2 provided a tad more micro detail and clarity, it wasn’t enough of a difference to warrant the price jump in my opinion. There’s a sense of clinical accuracy and sterility that can sometimes be overwhelming. A lot of people can’t really handle all that, and it’s understandable because I have a tough time with it as well. Simply put, there’s a reason Chord made the Mojo. It provides mind blowing sound quality at a fraction of the price for the average listener who wants the best out of their purchase (and the best out of their headphones). Even an audiophile would be hard pressed to look for better sound after hearing this thing. It really is that good. No hype. No BS. Now for the official comparison!! Before we get into the Chord Mojo vs. Hugo 2 comparison, grab a snack, sit back and relax because..
I’ve only heard a few Amp/DACs thus far that have truly blown me away. One was the Bryston BHA-1 playing back Over the Hills and Far Away through a HIFIMAN HE400i. Learn more: HIFIMAN HE400i Review! It was the first time I felt like I was hearing the music in a way that the artists intended. It had this astonishing realism that I really have yet to experience since in it’s fullest capacity. That is, until I heard the Mojo. I got that same sort of vibe listening to Time by Pink Floyd out of the same Bryston. It was like David Gilmour’s backing guitars were actually breathing. As if they actually had a life of their own. I was using the MrSpeakers Aeon Flow Closed, which I also highly recommend to pair with this Mojo. Learn more: MrSpeakers Aeon Flow Review! Simply put, I enjoyed the Mojo a bit more from a musical standpoint than I did with the Hugo 2. We’ll take a look at the Similarities and Differences between them in a bit. Let’s get into the technical and not so technical differences! Both provide coax and optical output. Both have exceptional build quality, although the Hugo 2 is certainly heavier and clunkier. Both are a breeze to set up once you understand how they prefer to be handled. 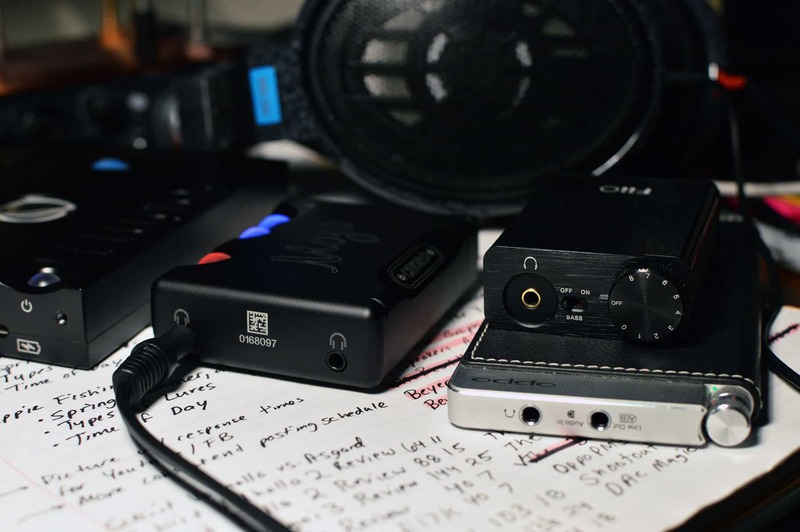 More on that in the Chord Mojo DAC Review! In fact, hooking up the Hugo to my PS4 was a breeze. I basically plugged everything in and it worked immediately without me even having to go into the settings! Both support PCM files of up to 768kHz. Both are excellent for Gaming. If you’re interested in some Gaming headphones, Learn more: The Best Headphones for Gaming! Sound. We discussed it at the start, but the Hugo 2 does indeed provide a bit better of a conversion, a little more clarity and detail, and certainly more raw sterility. Does this make it better? Depends on who you ask. In my opinion it doesn’t. It just means it’s a bit cleaner, and maybe not as enjoyable as a Mojo. The Mojo, while still technically proficient, has a tilt of warmth which makes it immensely enjoyable in my estimation. Price. The Mojo is much more affordable for a wider variety of people. This makes it a logical choice among-st audiophiles and casual hobbyists alike. Buttons. 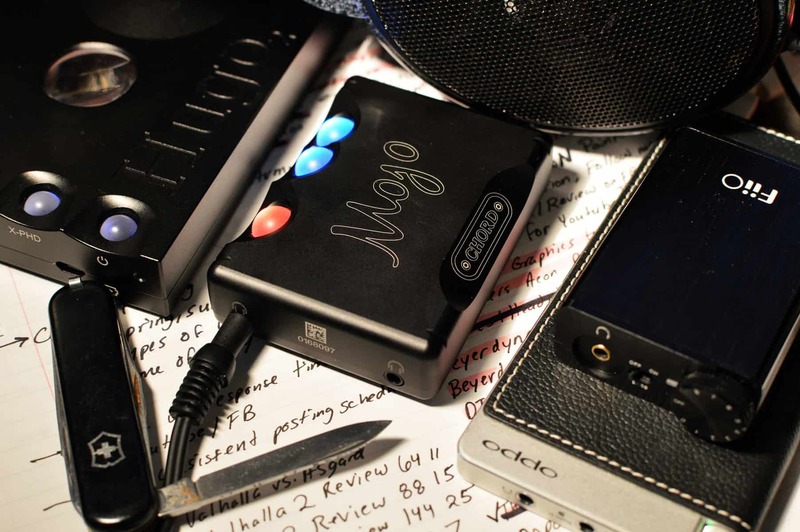 The Hugo 2 has an “input” button to scroll between sources while the Mojo does not. So basically, if you’re using a Hugo 2 with a Gaming console and then switch to USB from your PC, you’ll have to press the button until sound plays. For me this was a little weird. It was like putting a blindfold on and swatting at a pinata. Yeah you’ll probably hit it, but it’s a bit of an educated guesstimate. Still, not that big of a deal I guess. Outputs. 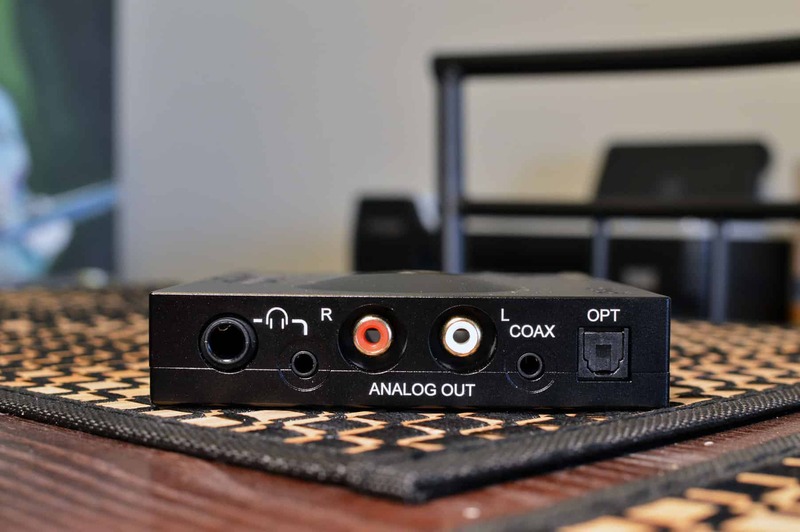 The Hugo 2 provides RCA/Analog outs while the Mojo does not. This may be important to you depending on what you’re using as a source. Portability. The Hugo 2 is much less portable than the Mojo. I can put the Mojo in my pocket and move around with it quite easily. The Hugo 2 is much more cumbersome and I wouldn’t really recommend lugging it around, although it is possible. It’s not huge or anything, but definitely larger than the Mojo. Jacks. Both provide 2 separate headphone jacks, but the Hugo’s is a 1/4″ jack and 3.5mm one. The Mojo provides 2 3.5mm jacks. Features. 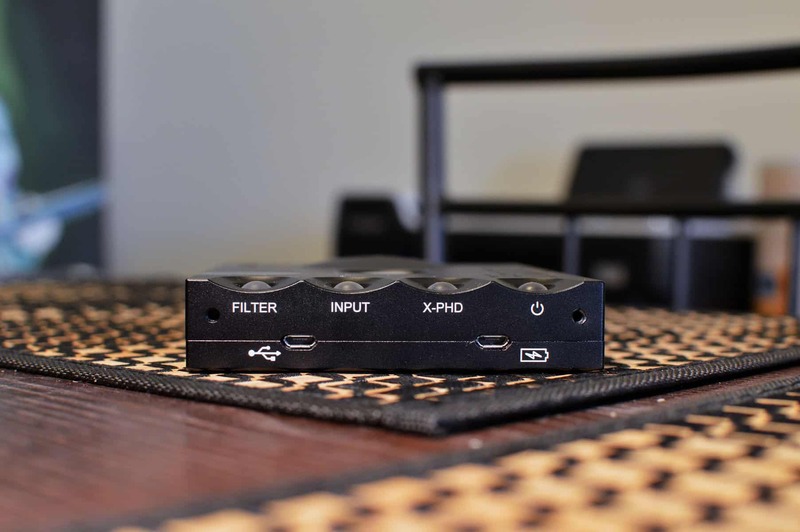 The Hugo 2 provides an (X-PHD) for adjusting the crossfeed between left and right channels, the input button that we discussed above, a filter button for changing the frequency response, and a power button. 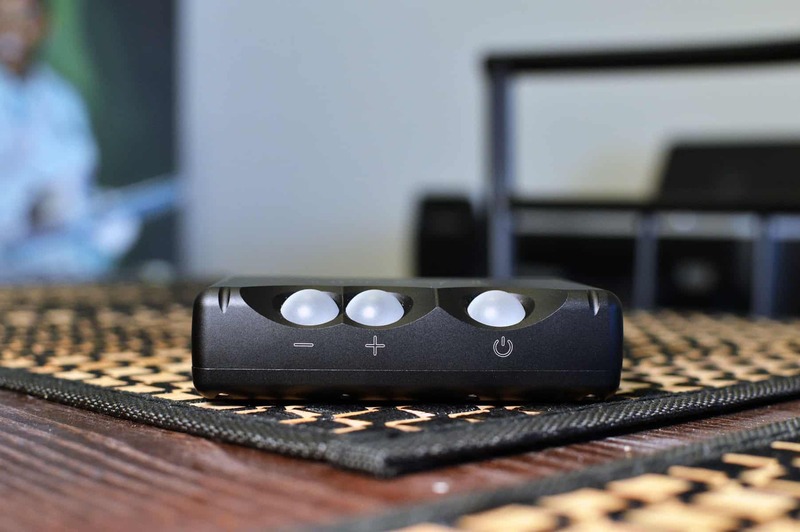 The Mojo provides a power button and volume buttons. Volume discrepancy. Speaking of volume buttons, the Mojo’s volume controls are in fact buttons while the Hugo 2’s volume control is that large all seeing eye thing in the center. You don’t press it; you instead scroll with it using your finger and it changes colors depending on how loud the sound gets. I really liked it! Check out the Mojo’s official spec sheet on Chord’s Website! Check out the Hugo’s spec sheet on Chord’s website! As I mentioned in the open, my recommendation is most certainly the Mojo today. The Hugo 2 is a bit technically superior, but it’s such a small difference and you may not even like the fact that it sounds cleaner. This is because it loses some of it’s musicality and warmth in the process of rendering everything so darn sterile! The Mojo has a bit of a warmer tilt to it and sounds a lot more natural to my ears. It’s also more portable and a heck of a lot more affordable! It’s a match made in heaven with all headphones, and will serve you well for years to come. I’ve done enough swooning for one day..
Well that’s about it for today my friend! I hope you’ve enjoyed this Chord Mojo vs. Hugo 2 Comparison. Thanks for your post on Home Studio Basics. 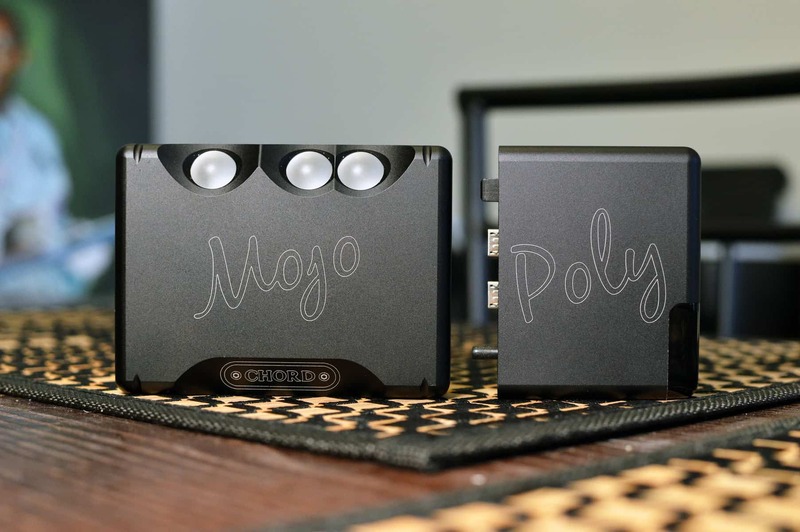 I liked the side by side comparison you show for the Chord Mojo vs. Hugo 2; the first thought you get is that the Hugo 2 must be extremely better than the Chord Mojo, especially when you get to the bottom line. Of course, reading your article makes you rethink your initial assessment. Thanks for clarifying that the saying “you get what you pay for” is not necessarily true in these modern times. Thanks Hugo! I think it’s pretty awesome that you have the same name as an incredibly articulate sounding amp. 😛 Can I call you Hugo 2? Headphones are my thing when listening to music, and from whatever piece of equipment I want to hear quality performance. I think you summed up the Mojo better than anyone could with this review. 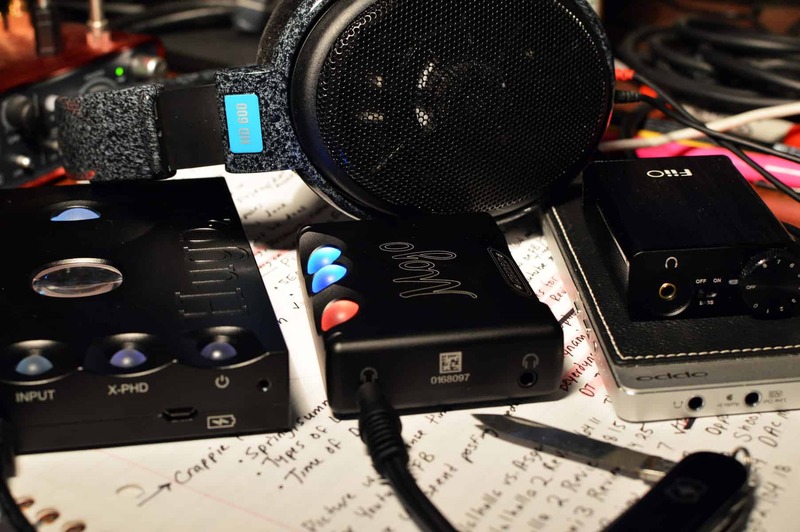 Performance and sound over price is what I usually look for in equipment when I am looking for new pieces, and with your review I know now what my choice is going to be when I am ready for a new headphone amplifier! I love the fact that two people can listen at the same time this is a real plus in my book also. Thanks Susan! Yeah for me the dual headphone outs are extremely valuable when A/B testing headphones. I will probably end up getting a Mojo sometime down the road. It’s just that much better than anything I’ve heard. Thanks for stopping by! Hi Stuart! I found your article very interesting. You provided a really precise review of Mojo and Hugo 2 components, and I especially I liked the comparison chart. I’m sure this will be helpful for me down the road in deciding which amp to buy. Keep up the good work! Thanks Luke! Let me know if you ever need some advice moving forward. Wow this is a very good and detailed review of some great devices. Technology has improved so much now that you can get good quality for a quite reasonable price if you know where to go. I really like your visuals on this article too as it brings your content to life! Thanks. Great review on the Mojo! I’ve been in the market myself and hadn’t really read a good review on the Mojo. Kind of pushing me that way after reading. You say it is good for gaming, would you say the cold sound is actually a good thing when it comes to an intense action game? As far as headphones go, do you have a suggestion for gaming? A preferred headphone if you will? As for the perfect Gaming headphone, what’s your budget? For an entry level I love the Samson SR850 with no amp needed. It provides a pretty incredible Soundstage and had me ripping the headphones off in a panic when watching Garden State, Rushmore, as well as playing Fallout 4. Can’t recommend them enough. Would also love it if you checked out my comprehensive article on The Best Headphones for Gaming It goes into a lot more detail! Let me know what you think and thanks for stopping by..
Fortunately, I’ve had the pleasure of using both Mojo and Hugo 2, and I can honestly state that the review here is exactly just as I would describe it. The Hugo 2 has a nice warm tone, but I think the Mojo is a lot more enhanced. That’s probably why I always have the Mojo with me lol. Anyway, I totally recommend these two, as they’ve both been really helpful products for my little studio at home and they are very much worth every penny. Do you know any other models that provide much more enhanced sounds? I am looking to upgrade my studio and buy new materials. I wouldn’t call the Hugo’s tone warm, but I do agree that the Mojo seems more fleshed out and natural sounding. To be honest I really don’t think the average person needs to delve any deeper than a Mojo, at least to start. I’ve heard a lot of expensive sounding amps and I can’t honestly say that any one of them sounded that much better. The Bryston BHA-1 was probably my favorite though. The differences in DAC/Amps are a lot more subtle than people would have you believe. Thanks for this insightful review! it’s been interesting learning about the different qualities in some of the headphones you mentioned. I expect when you know what your listening for, you can identify the differences in pitch? 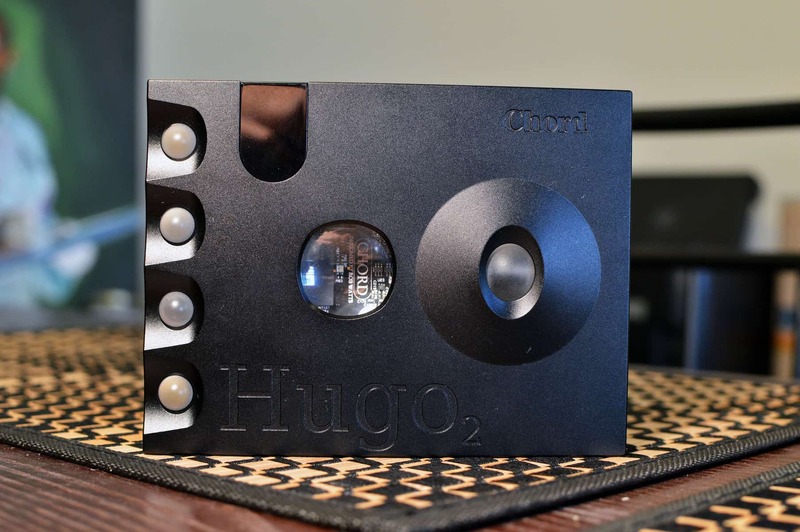 The Hugo 2 is very expensive so it’s great to get a review comparison with another product. With the huge difference in price it’s surprising to see the opposite with regards to quality. Yeah for sure! A great amp like the Mojo or Hugo makes it really easy to identify different low, mid, and high frequencies. For instance I can decipher the mid-bass and sub-bass apart much better than I could with a lower quality DAC/Amp. For me it’s a bit easier distinguishing treble frequencies and the metallic hue that sometimes is a detriment to an otherwise great headphone. The mid-range is a bit harder to evaluate at times outside of the 2-5k area that we’re most sensitive to. Because I have a background as a producer/beatmaker, a great amp is such an asset when I’m trying to really hone in on the perfect amount of impact and weight to a track. That’s why the Mojo is king; it makes the process 100x easier. You simply wouldn’t believe how this amp brings music to life. It’s almost like the artist is there with you at times! Great review! I love that comparison chart and thanks for your honesty. So often reviewers won’t just come clean that the two products are actually very similar with their bottom line. That actually helps me a lot. I’ve been looking into these exact two products and wasn’t sure if I should shell out the extra bucks and if it’d even be worth it. Thank you! Thanks Eric! Please keep me posted on your decision.. I would love to help out in any way.. If we don’t hear that big of a difference in passing then I guess the cheaper “Chord Mojo” version is the smarter buy in the short term then? I like the fact the Mojo will improve sound quality and clarity. 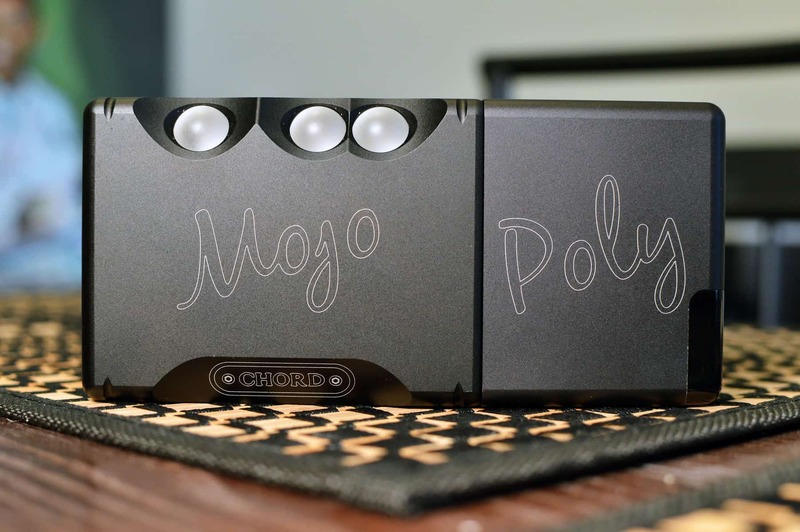 Much like the bose stereo systems, I think Chord Mojo may be a nice amp, can’t wait to hear it when mine arrives. I read through your review as well (of Chord Mojo) and I got to say I am quite impressed, you are VERY comprehensive and thorough. Thank you very much for introducing me to the Chord Mojo. I am in the market for a new amplifier and I’ll head on over to amazon and see if I can’t purchase one in the next day or so. No problem David! I would say the Mojo is the better short term AND long term buy. It will keep you more than satisfied for a long time. In all honesty, I’ve heard a lot of amps but the Mojo is one that I wouldn’t consider trading in if I had it. It’s that good. Keep me posted and let me know how you like it! I agree that for the majority of people, the Mojo will be just fine as the level of detail is the same. The Hugo is so extremely sterile and I think that may turn off some people. It kind of has this tendency to try and become too perfect, resulting in a loss of character and a sort of human element in the process. Still a fantastic Amp/DAC but I don’t think it’s worth all that extra money. Wow these products certainly have a huge price difference (about $1500) and you are saying that the Mojo is a better buy than the Hugo 2. It’s great to read honest reviews like this because most people would just promote the more expensive item, and you are giving the cheaper one the thumbs up. I would love to set up my own mini sound studio at home to listen to my music and have it sounding good. What would you say the most important and the first piece of equipment is that one should invest in for this project? I want to start small, but still want the sound to be good. I would say the most important part of an audio chain, outside of the computer itself, is the Audio Interface. 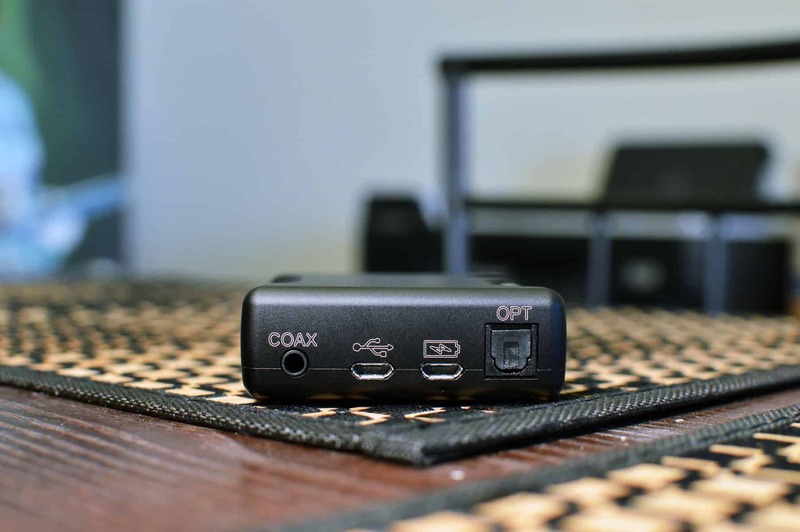 This functions as a DAC (Digital to Analog Converter) so it converts the 1’s and 0’s that your PC understands into Analog that you hear through headphones or speakers. So: An Interface like the Scarlett 2i2 also can be used as a headphone amp/DAC, it can power your microphone via 48v Phantom Power, it can power studio monitors, and you can use it to record instruments. It’s the best investment I think. I’ve had one since 2014 and I can’t justify selling it no matter how many times I’ve tried. Lol. Great review! I love that comparison chart and thanks for your honesty. the Mojo is my favourite.The fact that the Mojo will improve sound quality and clarity is something that my son has been wanting in an Amp/DAC for awhile now. I think I’m going to order it for his birthday gift! You helped a lot by describing those two and the way you made a good comparison between Hugo2 and Chord Mojo. Thank you for such informative review. Please keep me posted on your decision. If you do end up getting it for him he’ll basically never disobey you ever again. LOL.